Bohemian Villages wasn’t really on my list of games for Essen until about three days prior to the show. This was mostly due to the fact that I hadn’t had much information to go on until that time. I knew that it was from dlp games, and that is a publisher which usually makes games that interest me – but a publisher which also historically has been hit-or-miss for me. However, since Orleans, I have definitely made it a point to always see what sort of game Herr Stockhausen has to offer! Furthermore, I’m a big fan of the game’s artists, Klemens Franz and Andrea Kattnig. 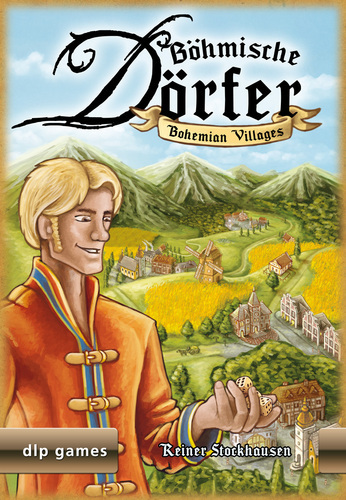 In the game, players want to be the wealthiest citizen in the varied Bohemian villages that will make up the game. In the game, you will play with somewhere between 6 and 9 different village tiles (depending on player count). Each is double sided, and you can randomly choose which side is to be played for each tile. Once the board is set up, place a number of Inn tiles next to the board equal to the number of inns visible on the tiles. Likewise, place glass counters and flour tiles equal to the numbers of glass factories and flour mills seen. On a turn, players roll 4 dice and then combine the dice rolled into one or two multi-dice combinations – you will not be allowed to use a single die for anything; they must always be in combination with at least one other die! Thus, you can make two groups of 2 dice each, or one group of 3 dice or one group of all 4. 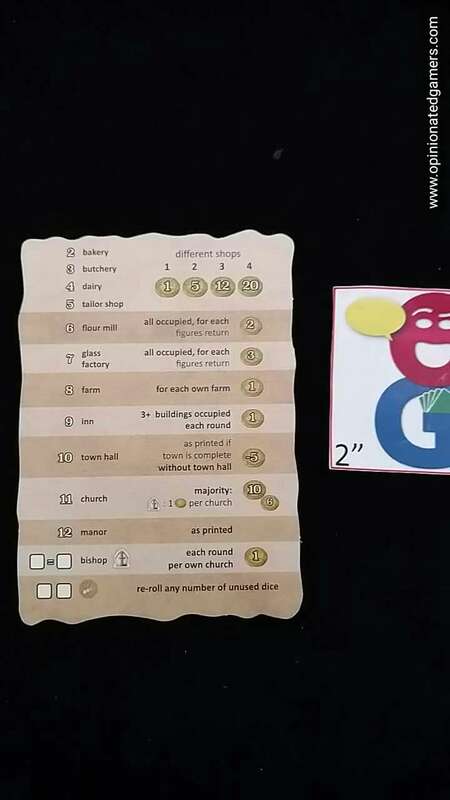 You will use whatever number(s) in the groups that you create to then place one of your workers on a building in the villages with a matching number. Each building can only accommodate a single worker, and if there are no available buildings of a given type, you likely can then displace a previously placed worker with your own. Some buildings allow for replacement (farm, inn, town hall, church) while others do not allow any replacement (manor). The shops are slightly different and they only allow you to kick someone out if you do not already occupy that type of shop. There is a handy chart on page 3 of the rules which clearly summarizes the rules for this. It would have been really nice for this chart to be on a player aid or somehow depicted on the buildings. The game continues on until a player starts his turn and has no figures left to place. At this point, you will score you placed workers. As I explain the different types of buildings below, I’ll include the scoring rules for each type as well. Shops – you will score 1/5/12/20 for each set of 1/2/3/4 unique shops. You can have more than one partial/full set of shops. There are four different types. Remember that these shops have a special displacement rule that you may only kick someone out of a shop if you are not already in that type of shop. Flour Mill (6) – When you occupy a Flour Mill, take one of the flour tokens next to the board. When all flour tiles are taken (which therefore means that all Flour Mills are occupied), then there is an intermediate scoring. All Flour tiles are returned to the table for 2 coins each, and all figures on Flour Mills are removed from the board. They can now be placed again. Glass Factory (7) – when you occupy a Glass Factory, take a glass tile. When all Glass tiles are taken, there is an intermediate scoring and each Glass tile is worth 3 points. All figures on Glass Factories are returned to their owners. Inn (9) – When you occupy an Inn, you take an Inn token – which is double sided. 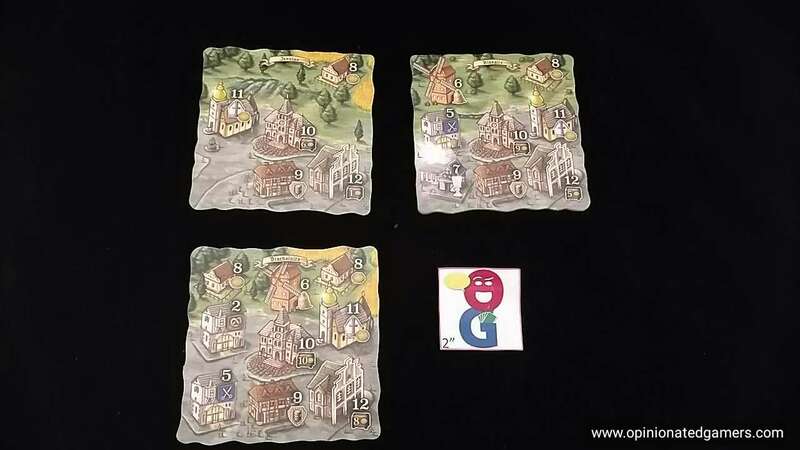 If three or more non-inn buildings are occupied in that particular village, turn the Inn token to the active (Colored) side. If there are fewer than 3 occupied buildings, leave the Inn token on the grey inactive side. Once three buildings in that particular village are occupied, you can turn the token over to Active. Once an Inn token is active, it never reverts to the inactive side, even if buildings in that village become unoccupied. At the start of every turn, before you roll the dice, you get one coin per Active Inn tile in front of you. If someone takes over an Inn from you, you give them the Inn Token – the activation state does not change. Town Hall (10) – Town Halls are only scored at the end of the game. Each one has a coin value next to it. You will score this value only if every building in the village is occupied at the end of the game. If there is even one unoccupied building, you score nothing. Additionally, if you do not occupy at least one Town Hall at the end of the game, you must pay a 5 coin penalty. Church (11) – Churches score at the end of the game. The player with the most churches at game end scores 10 coins, the second most scores 6. If there is a tie for first, all tied players get 6 coins and there is no payout for anyone else. Churches might also score during the game if you have the Bishop token. Manor (12) – You immediately receive the coin value printed next to the manor. You may never be displaced from the manor, so this building only pays out once per game. Other than the buildings, there are two other ways you can use your dice. Bishop token (any doubles) – any pair of identical dice can be used to take the Bishop token. If you hold this token at the start of your turn, you will score one coin for each Church that you occupy at that time. Re-roll token (any 2 dice) – you can turn in any two dice for a re-roll token. This can be used at any point to re-roll any or all unallocated dice. You may only ever have one re-roll token at a time. Once used, the re-roll token is removed from the game (there are 7 available each game). Leftover flour and glass tiles are summed and halved, rounding down. The player with the most coins win. No tiebreaker is given in the rules. Bohemian Villages is a nice light dice rolling game. The rules are fairly simple to follow, and once you’ve explained the functions of each of the villages (which is mostly summarized on the player aids), it’s easy to figure out what your options are. Like many dice games, you’ll do a lot better if you roll the numbers that you want. That being said, the rules of combining and playing the dice give you a number of different options each turn. You’ll likely play more meeples to the board if you always make two pairs of dice – but the ability to make combinations of three or even four dice, you might have a better chance of getting a specific number, though you’ll only be able to place one meeple on that turn. While a lot of your decisions are based on what you roll, you do have some long term decisions – playing for the shops (2-5) and the town halls (10). The manors are one-time immediate scoring places, and the farms (8) and the inns (9) are the most direct method of immediate scoring. The flour mills (6) and the glass shops (7) are only slightly deferred as you have to wait until all the spots are filled to score. 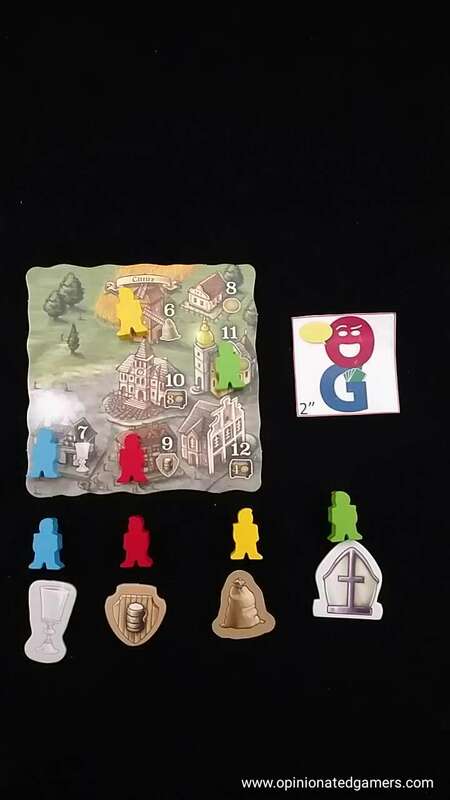 The churches (11) are mostly a race for the end of the game, though you might be able to squeak out some scoring if you have the bishop token. In our games, the bishop token tends to be taken away from anyone who might score two or more points from it. For the most part, turns go fairly quickly. You roll the dice, generally consider your two or three combination options, and then place your men. There might be a bit of extra decision making if you are replacing an opponent’s man on the board – you should likely try to target the player that you perceive to be in the lead – for the most part, you’re just worrying about your own situation. Near the end of the game, you might also be making a decision on prolonging the game or not – a player can have all of his meeples on the board, and the game will end if one of them isn’t returned to him by the start of his next turn. My first few games have brought up the question if there is a turn order issue. The distribution of the manors (the 12 buildings) is random, and there are definitely some buildings which are worth far more than others. The players earlier in turn order have the first chance at the higher VP Manors, and there is no way to displace a worker from those spaces. I suppose that there is a possible downside that Manor worker is placed permanently, but I have yet to see how this is a disadvantage. While I guess I’ll need to play a few more times to see, but it certainly feels like the players in earlier turn order get better chances at the high scoring Manor locations, and there is no compensation to the players later in turn order. The rules are fairly clear other than the possibly confusing rules around the replacement rules for the different types of buildings. While I do wish that the player aid would have the replacement rules on it somewhere, after the end of your first game, you should be able to remember when and where you can replace other people. 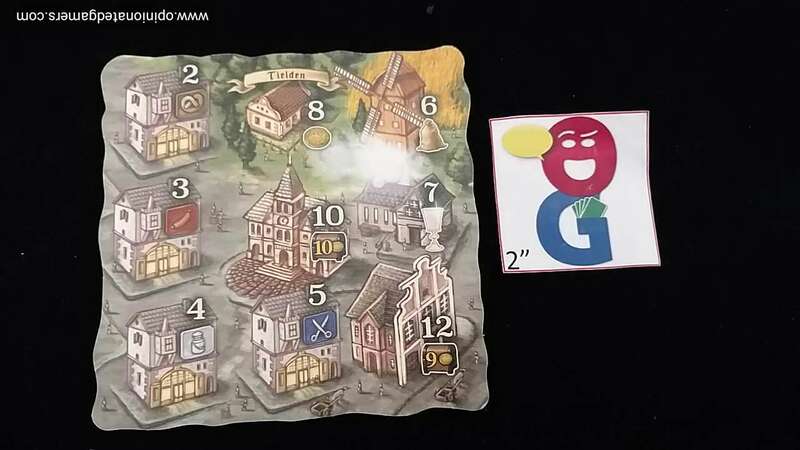 Will Bohemian Villages be an evergreen game? Possibly not. But it’s a solid family game that will certainly get to the table during the flurry of post-Essen play. It remains to be seen whether the game length is long for what you get and whether or not there is a first player bias. Thus far, we like it enough to keep playing it to figure those things out. Doug G.: After some excellent titles from dlp Games, this one fell VERY flat for us (with the asterisk that we played it 2-player only). Not one we plan to play again…. I like it. Dale Y, Greg S.